We usually buy coriander in small bunch. Sometimes the bunch includes other herbs like spring onion and mint. 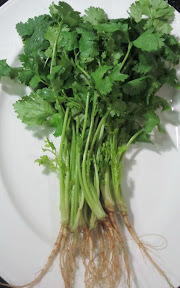 We can use all parts of coriander in cooking, both stalk and leaves are good in garnishing the dish. The roots are mixed with garlic and pepper is the use in marinate the meat for grill or fry. The Aroma of this mixture is so special that we add in the soup or stew as well. Fresh Coriander could also be eaten fresh assorted with other vegetable with Sweet and Sour sauce with the grilled Shrimps or Catfish or เมี่ยงปลา, น้ำปลาหวาน. The seed of coriander is used in the mixture of curry paste as well.